Yes, Cambodia is home to Angkor Wat, the world’s largest religious complex and one of the most impressive structures ever built by human hands. But it is also much, much more; a magical landscape of ancient ruins, fascinating creatures, mist-shrouded mountains, and potent peppers that have become the darling of the culinary world. Venture deep into the dynamic cities and gorgeous countryside of this elusive Southeast Asian country to learn its stories, from the dawn of time through its troubling recent past to today, where the future, finally, looks bright. 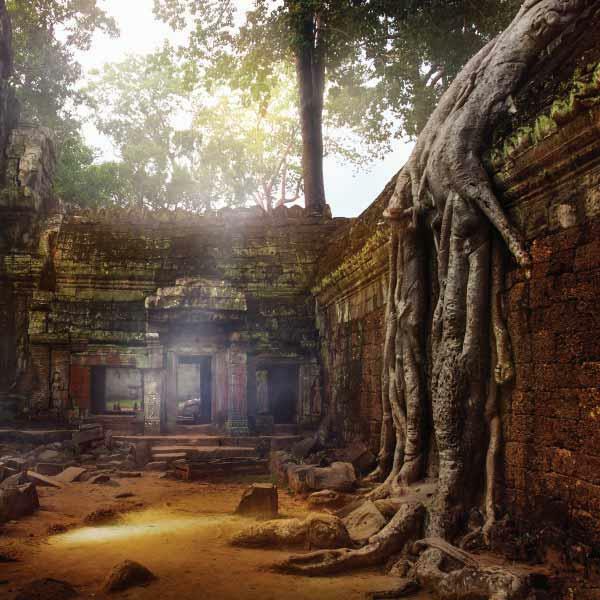 This fascinating Explorers Club Collection itinerary tells the tale of Cambodia’s history through the ages, from ancient times through the dark chapters of the recent past and into a bright future that’s still being written. It begins in Phnom Penh, the ever-evolving capital where tradition and modernity collide. Near the banks of the Mekong, you’ll explore the city’s oldest market, marvel at the colonial architecture of French Quarter, and visit the enormous Wat Phnom pagoda before sobering encounters at the Tuol Sleng Genocide Museum and Choeung Ek Genocidal Center (the infamous Killing Fields). Beyond the capital, other secrets await. You’ll meet sun bears and Asian black bears (moon bears) at the Phnom Tamao Wildlife Centre, explore the fascinating islands off the coast of Kep, visit a plantation where Kampot peppers are grown, spend the night high up in the Cardamom Mountains at an exclusive tented camp and learn about the wildlife protection efforts here. The journey concludes in Siem Reap, gateway to Angkor, the Khmer “City of God-Kings.” Here, you’ll walk the grounds of the world’s largest religious complex with a local archaeologist who will merge legend with fact as you visit famous temples like Bayon, Baphuon, Preah Khan, and others. Later, get a glimpse of the massive temple complex from the sky courtesy of a special microflight (subject to local permission), see the staggering collection of statues preserved inside the Angkor Conservation Center, and (of course) capture the postcard-perfect sight of the evening sun setting over the temple’s spires from the quiet confines of Pre Rup.